"Every country trembled before him, fear was in their hearts; all the rebels came bowing down for fear of the fame of his majesty,"
Various names were used to refer to the king of this timeless land, but for most of its ancient history, Egypt was under all-powerful monarchs of divine status known as pharaohs 'Pharaoh' is derived from the Egyptian phrase, "per aa," which means,"great house." The name, that originally referred to the royal palace, began to designate the sovereign himself only late in the New Kingdom In the same way the White House has come to mean the president of the United States. For three thousand years, the wearer of the pharaoh's crown dominated life in Egypt and throughout the civilized lands of Africa and the Near East. The blue and yellow striped Nemes (headcloth) with its two lappets over each shoulder, commanded great awe, instant respect and absolute obedience. 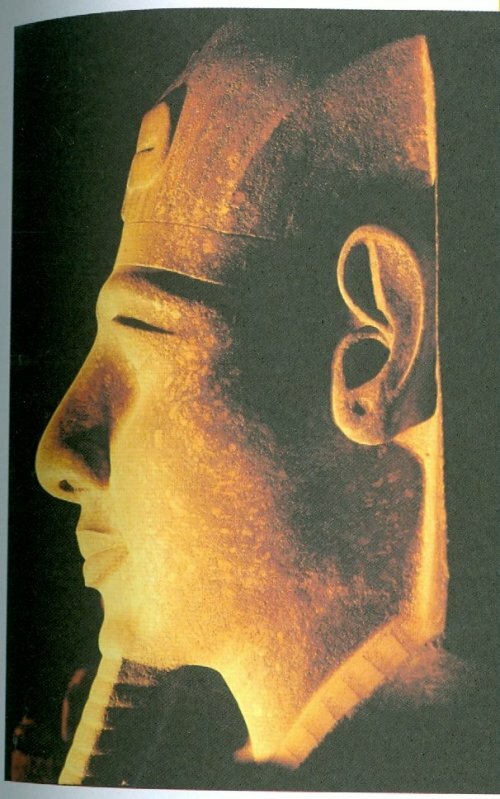 Ramses II, also known as Ramesses the Great, was without peer. Of all the pharaohs who continued to live on in legend long after their deaths, none was more celebrated than Ramesses II. He was born in 1314 BCE and died at the age of 90 in 1224 BCE, three times the average life span. He ascended the throne in 1279 and ruled for 66 years, dying in 1213. 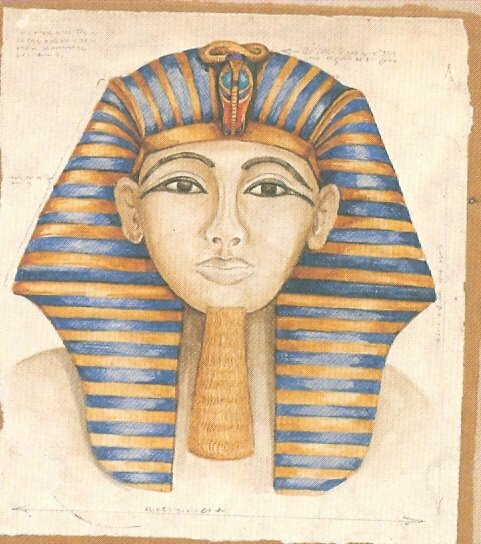 He reigned during the 19th dynasty of the 12th century BCE. His glories surpassed those of all other pharaohs and during his reign, Egypt reached a state of great prosperity with gold and other goods flooding into Egypt from conquered countries. Thousands of workers laboured to laud his name and fame with marvelous statues and structures, He augmented these by having his name inscribed on any monuments of his predecessors to which he took a liking and thought should bear his name. Thousands of years later, these images still attract tourists who stare and marvel in amazement at their size and grandeur. King Ramses promoted the cult of the divine pharaoh with this great galaxy of spectacular statues, venerating the lord of the land of Eqypt. 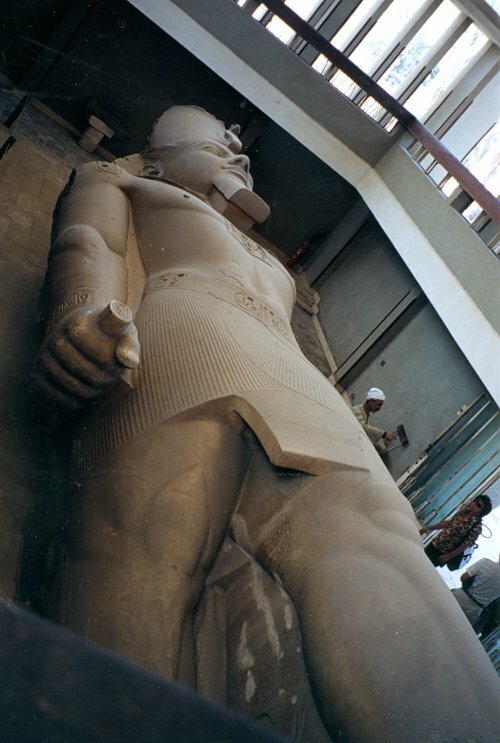 Among them is this gigantic statue at the temple of Luxor, Eastern Thebes. Within this mortuary temple of Ramses II is this personification of one of the Egyptian nomes (provinces) presenting to the pharaoh, the bounty of her part of Egypt - bread, figs, pomegranetes and the hieroglyphs for "life" and "dominion". "Egypt," wrote the Greek father of history, Herodotus, in the fifth century CBE, "is, so to speak, the gift of the Nile." This longest of earth's rivers, made Ancient Egypt a land of abundance and pharaohs were first to claim their reigns reaped the good harvests. In an inscription in the temple of Abu Simbel, Ramesses II puts these words in the mouth of the god Ptah: "I give you, Ramessses II, constant harvests ... the sheaves are like sand, granaries approach heaven and the grain heaps are like mountains." Like his father before him, Ramses was a great military commander, a warrior king who waged successful struggles against Libya, Nubia and the Hittites. 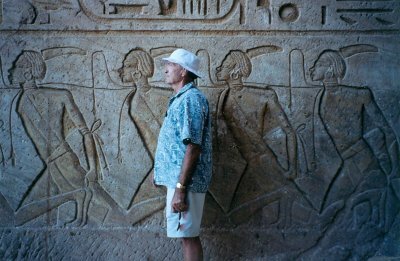 He achieved wondrous exploits in battle, the details of which he never tired of telling on the architecture and artifacts found throughout Egypt. Ramses routing the Hittites at the Battle of Qadesh (Syria). According to his own accounts, verified by those who liked living, Ramses regularly turned defeat into victory by his glorious leadership, dauntless bravery and military sagacity. He was without doubt in his own mind, the man for the moment. 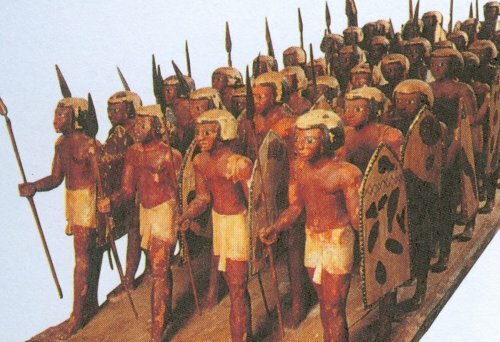 Egyptian soldiers, equipped with spears and rawhide shields, advancing into battle. The Egyptian army had a core of full-time soldiers, who in peacetime occupied garrisons spread among Upper and Lower Egypt, Nubia and Asia. In the event of large scale fighting or in order to put down revolts, the pharaoh could augment his standing army by conscripting one in ten of any able-bodied men in the temple communities. Foot soldiers were grouped into companies of two hundred comprising 20 platoons. Companies were divided into divisions of around five thousand men. Infantrymen, who used javelins, stabbing daggers and short scimitars, wore armour consisting of padded caps, raw-hide shields and triangular sporrans. 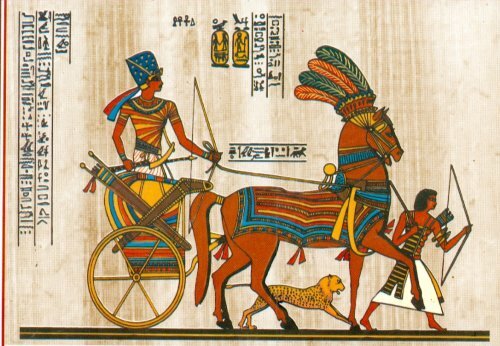 Chariots were made of light, wicker-work and were important for speed rather than armament. Each driver wore a helmet of leather or bronze and body armour. Riding shotgun was a companion, armed with a bow, arrows and javelin. Chariots were grouped into bodies of fifty under a major; larger groupings were commanded by a colonel or lieutenant-general. Egyptian archers were most feared for their powerful, composite bows. Units were deployed in 'centres' and 'wings' and charges were common. Siege warfare was not practised with any success, the attackers simply sitting things out until the enemy submitted to hunger. The Hittites comprised an ancient empire of Asia Minor, that reached its zenith c. 1380 BC. They were among the most powerful and civilized of the early Indo-European peoples. They came down across the Bosphorus, the Hellespont, the Aegean or the Caucasus and established themselves as the ruling military caste over the indigenous agriculturists of the mountainous peninsula, south of the Black Sea, known today as Asia Minor. Towards 1800 B.C., they settled near the sources of the Tigris and Euphrates, from where they spread their arms and influence into Syria and Palestine. Ramses successfully restored Egyptian control in Palestine and southern Syria and in so doing, came into conflict with the Hittite Empire which extended southward from its centre in Asia Minor. The Hittite army clashed with Egyptian troops led by one of Egypt's worthiest warriors, Ramses II. One of his most important battles was against the Hittites at Kadesh on the River Orontes, which rises in northern Lebanon and flows through northern Syria and southern Turkey before entering the Mediterranean. Ramses ultimate military achievement was capturing the Syrian city of Kadesh from the Hittites in July 1274 B.C. The city had been lost during the chaotic reign of the Heretic King Akhenaten. 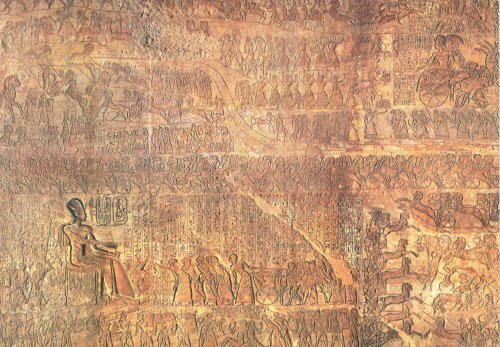 Scenes from this famous Battle of Kadesh, in which over 5,000 chariots were involved, are depicted in the Rock Temple of Ramses at Abu Simbel built by Ramses II (13th C.BC). The fierce fighting eventually resulted in something of a draw, but Ramses had his artists portray the conflict as a great victory by littering the landscape with dead and dying Hittites. 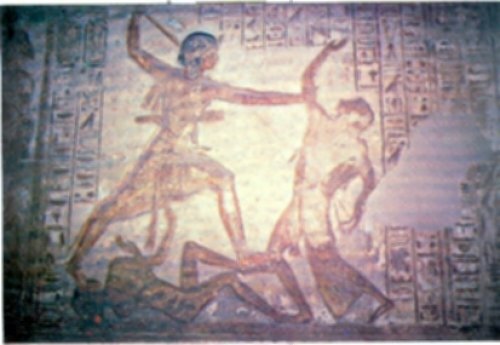 Truth sometimes submitted to triumph when it came to depicting Ramses' military exploits. Whether he won or lost, records showed his forces victorious. The people of Egypt required no less of their leader. Recording his exploits provided work to ensure their welfare during the long reign of Ramses and that was enough for them. The two sides accepted a treaty, the earliest in existence, signed about 1270 B.C. Two versions exist. The Egyptian is more blunt, indicating that Hattusilis, the Hittite leader, sent messengers to "beg for peace." A copy of the tablet of silver was brought to Pharoah by the hand of Hattusilis's messenger Tartesub and his messenger Ramose in order to beg peace. "Behold, Hattusili, the great chief of Hatti, has made himself in a treaty with Ramses, the great ruler of Egypt, beginning this day, to cause to be made good peace and good brotherhood between us forever; and he is in brotherhood with me and at peace with me and I am in brotherhood with him and at peace with him forever." The treaty was a complex one with provisions for nonaggression, mutual aid against attack and extradition of political fugitives. They both sought to save face by claiming to have assented to the appeal of the other for peace. The following relief is in the Temple of Abu Simbel. Elsewhere in this same temple, Ramses recorded details of the battle against the Hittites at Kadesh. This rendering, inscribed in both poetry and prose, employed a variety of literary devices to enhance its impact on the people. 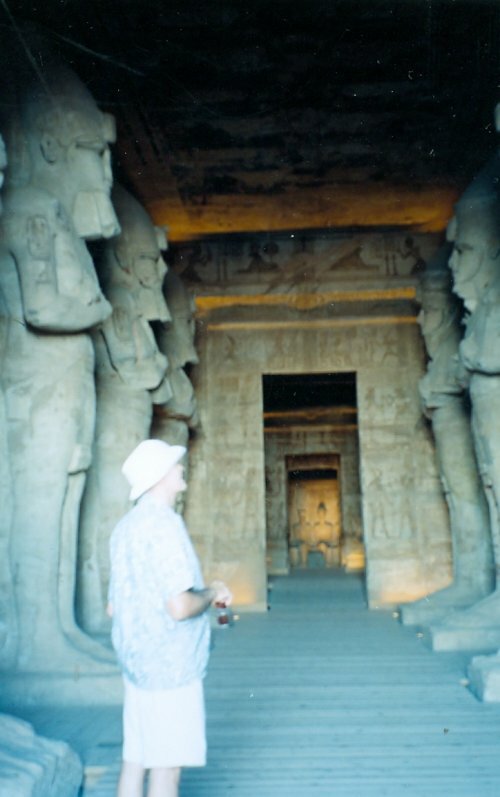 Accounts of it were very popular during Ramses' reign and for long after. Notwithstanding the widespread publicity and its popularity throughout the country, it was an understatement to call it inconclusive, much less a victory, for the Egyptians had to yield. Ramses' first campaign against the Hittites in the fifth year of his reign ended in an Egyptian retreat after the violent battle at Kadesh in Syria, during which Ramses himself narrowly escaped capture, thanks mainly to the intervention of a troop contingent arriving from Amurru. The continuing conflicts between the Hittites and Egyptians were finally concluded by a peace treaty in Ramses' 21st year. 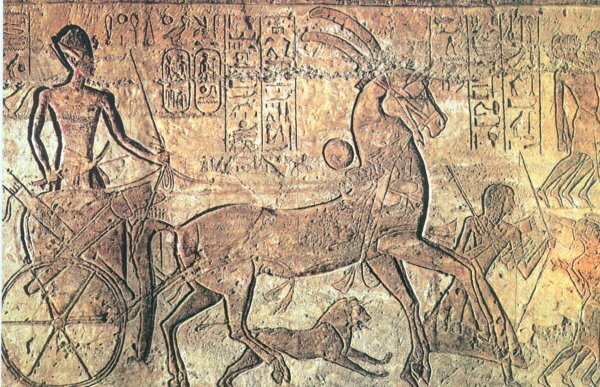 Ramses II in his war chariot charging into battle against the Hittites. Many rulers actually fought at the head of their troops, some even being killed in the action. Ramses was such a leader and wanted it well known. Dspite his army's retreat and near defeat, Ramses' officials trumpeted his decisive leadership as the penultimate reason for the victory at Kadesh. 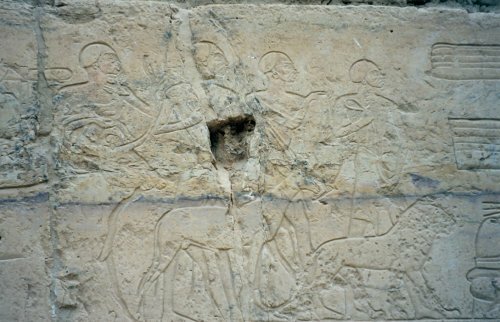 Carvings throughout the kingdom informed Egyptians that it was his dash and daring that made possible their successful assault, which resulted in them breaking through the Hittite army about to surrounded Egyptian forces. Ramses was actually saved by the intervention of a relief force which arrived just in time. No matter, the king as commander-in-chief controlled all military operations. The gods sanctioned his fighting prowess and it was they who granted success and to whom victories were credited. Temple of Ramses II - 19th dynasty - 1274 B.C. 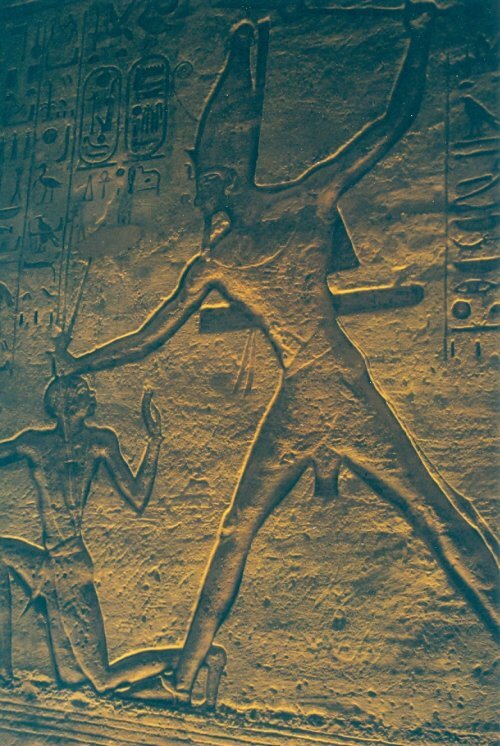 Beginning of the victory of King Usermare-Setepnere Ramses II, who is given life, forever, which he achieved in the land of Kheta and Naharin, in the land of Arvad , in Pedes , in the Derden , in the land of Mesa, in the land of Kelekesh , Carchemish, Kode , the land of Kadesh, in the land of Ekereth , and Mesheneth . Behold, his majesty prepared his infantry and his chariotry, the Sherden of the captivity of his majesty from the victories of his word - they gave the plan of battle. His majesty proceeded northward, his infantry and his chariotry being with him. He began the goodly way to march. When his majesty reached the city, behold, the wretched, vanquished  chief of Kheta had come, having gathered together all countries from the ends of the sea to the land of Kheta, which came entire: the Naharin likewise, and Arvad, Mesa, Keshkesh, Kelekesh, Luka, Kezweden, Carchemish, Ekereth, Kode, the entire land of Nuges, Mesheneth, and Kadesh. He left not a country which was not brought together with their chiefs who were with him, every man bringing his chariotry, an exceeding great multitude, without its like. They covered the mountains and the valleys; they were like grasshoppers with their multitudes. He left not silver nor gold in his land but he plundered it of all its possessions and gave to every country, in order to bring them with him to battle. Behold, the wretched, vanquished chief of Kheta, together with numerous allied countries, were stationed in battle array, concealed on the northwest of the city of Kadesh, while his majesty was alone by himself, with his bodyguard, and the division of Amon was marching behind him. The division of Re crossed over the river-bed on the south side of the town of Shabtuna, at the distance of an iter  from the division of Amon; the division of Ptah was on the south of the city of Aranami; and the division of Sutekh was marching upon the road. His majesty had formed the first rank of all the leaders of his army, while they were on the shore in the land of the Amor. Behold, the wretched vanquished chief of Kheta was stationed in the midst of the infantry which was with him, and he came not out to fight, for fear of his majesty. Then he made to go the people of the chariotry, an exceedingly numerous multitude like the sand, being three people to each span . Now, they had made their combinations thus: among every three youths was one man of the vanquished of Kheta, equipped with all the weapons of battle. Lo, they had stationed them in battle array, concealed northwest of the city of Kadesh. His majesty shone like his father Montu, when he took the adornments of war; as he seized his coat of mail, he was like Baal in his hour. The great span which bore his majesty called: "Victory-in-Tebes," from the great stables of Ramses II, was in the midst of the leaders. His majesty halted in the rout; then he charged into the foe, the vanquished of Kheta, being alone by himself and none other with him. When his majesty went to look behind him, he found 2,500 chariotry surrounding him, in his way out, being all the youth of the wretched Kheta, together with its numerous allied countries: from Arvad, from Mesa , from Pedes , from Keshkesh, from Erwenet, from Kezweden , from Aleppo, Eketeri , Kadesh, and Luka, being three men to a span, acting in unison. 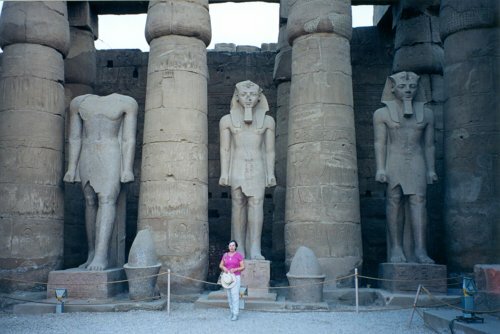 Ramses ruled Egypt well. Commerce flourished under him, both across the Isthmus of Suez and on the Mediterranean coast. The clergy benefited from this prosperity. According to Herodotus, the Egyptians were "religious to excess, beyond any other nation of the world." Egyptian religion espoused any number of gods and goddesses. Under Ramses the clergy thrived, for the spoils of every war and the lion's share of all taxes from conquered provinces were given by him to the priests and the temples. Eventually, so great was the largesse they received, that the people of the country starved so that the gods might eat. 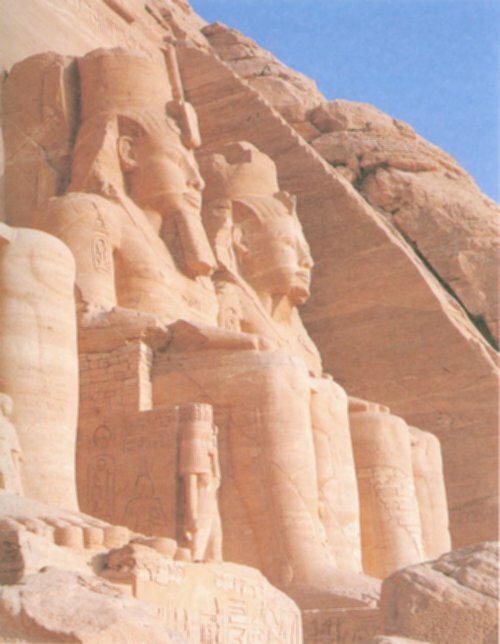 Ramses built so lavishly that at least half of all its surviving edifices are ascribed to his reign. He completed the main hall at Karnak, added to the temple of Luxor, raised his own vast shrine Ramesseum west of the River Nile and scattered throughout the land colossi of himself and his queens. 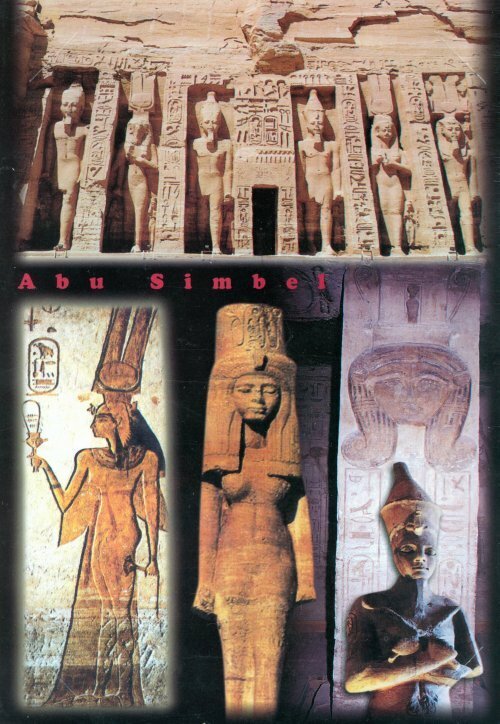 Ramses' handiwork included the magnificent Abu Simbel where he endeavoured to make himself into a god. The temple, called the "Temple of Ramesses, beloved of Amun," was not constructed out of blocks, but carved into the face of the rock. It was commissioned some time after the fifth year of his reign and not completed until the 35th year. 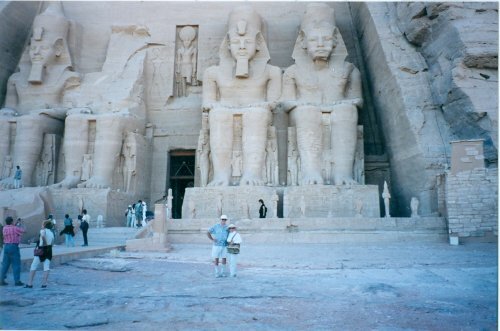 The massive facade of the main temple is dominated by the four immense, seated statues of Ramses, which have faced the scorching sun and burning sand for 3200 years. 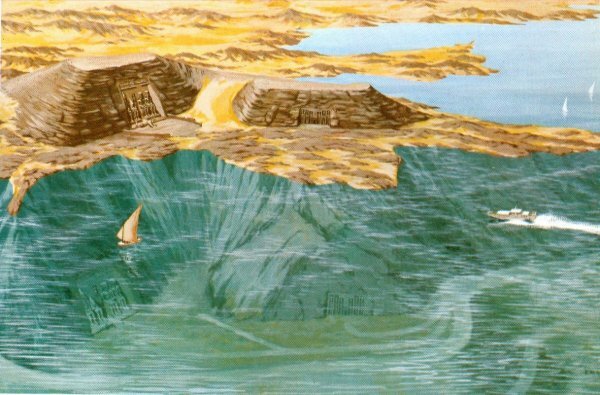 The magnitude of the monsters constructed not far from Nubia was intended to glorify his name and intimidate the Nubians, so that their gold would continue to flow into his coffers. 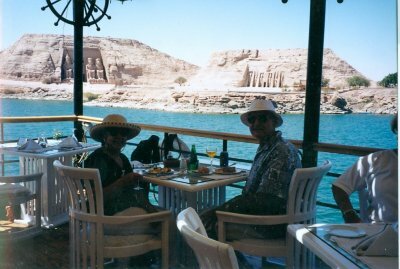 We began our visit to Abu Simbel with an evening sound and light show. Shortly after we took our seats, all lights were suddenly turned off and we found ourselves in the pitch blackness of the desert night. As we awaited the start of the show, we quickly realized that the real show appeared in the sky above us. Uncontaminated by any source of artificial light whatsoever, we saw for the first time ever, the millions of stars that filled the awesomely dramatic sky. It is little wonder ancient Egyptians were transfixed by hosts in the heavens above them. We could now understand why each pharaoh's focus was so fixed on the glorious firmament that glowed above them every night of their lives. Pairs of the colossal statues of the Pharaoh Ramesses II flank the entrance to the temple of Abu Simbel, each of which is 69 feet high. Smaller statues surround the four main statues and depict members of his family. 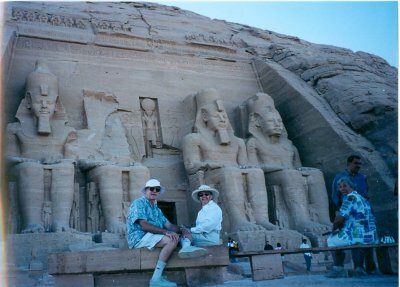 Ramses built a total of seven temples at Abu Simbel, but the "Temple of Ramses, beloved of Amun" is by far the most stunningly impressive. The long reign of Ramses, the longest of Egypt's imperial age, is one of the best-documented periods of Egyptian history. 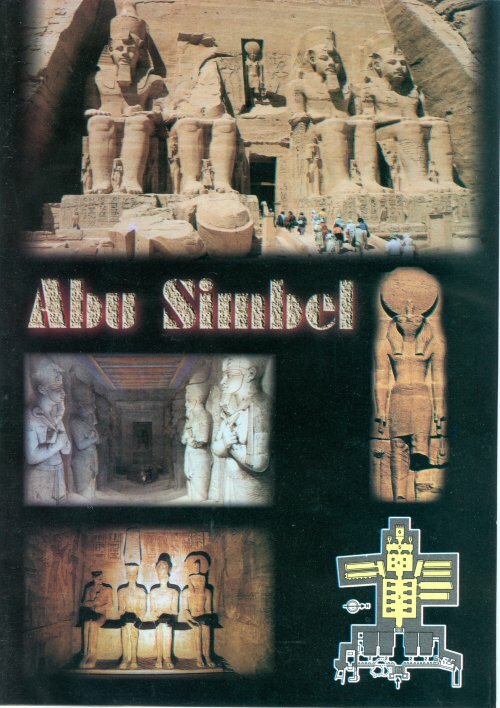 Like many of his other mammoth monuments, the temple of Abu Simbel incorporates accounts of the events of his reign. Between the legs and on each of their sides, stand statues of members of the royal family. 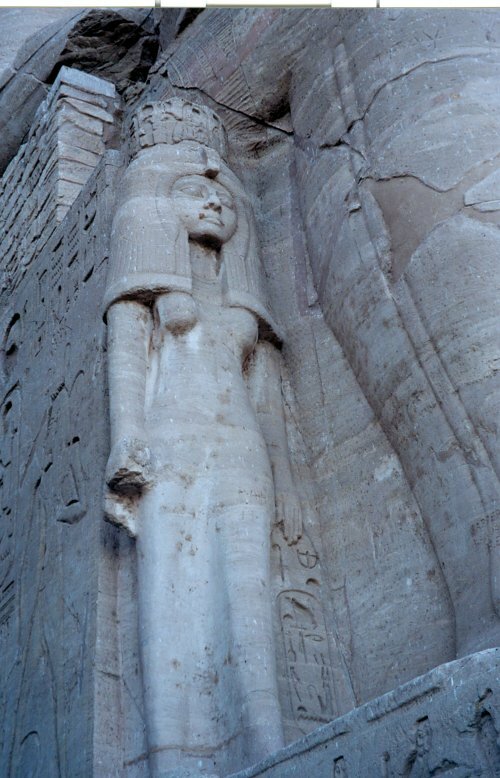 The smaller statues of relatives for the first southern colossus were probably: Queen Nefretari by the left leg, the king's mother, the great wife of Seti I, Muttuya, by his right leg and Prince Amenhirkhopshef in front. For the second southern colossus they are: Princess Bent�anta standing by the left leg, Princess Nebettawy by the right and one unnamed female figure, probably a lesser royal wife, named Esenofre. 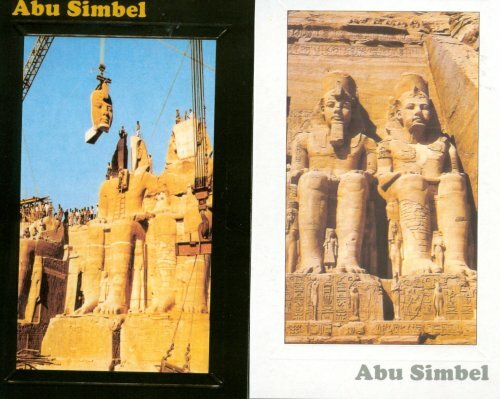 The two temples at Abu Simbel are not only magnificent monuments, but their removal and reconstruction was an engineering marvel. 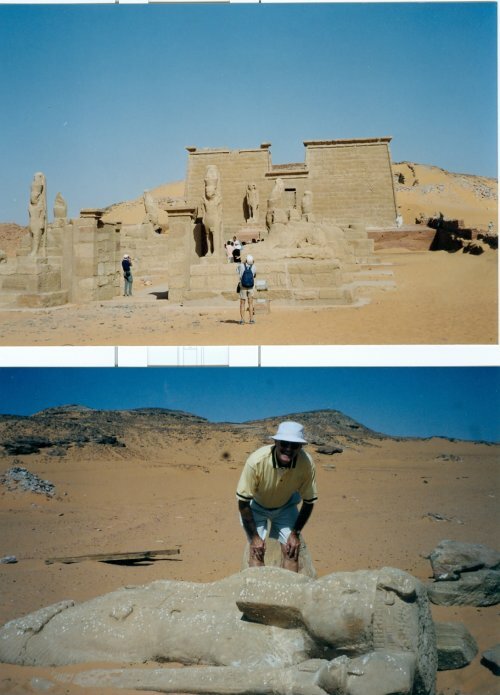 Images of the monumental statues filled newspapers around the world, when the temples were threatened by submersion in Lake Nasser as a result of the construction of the Aswan Dam 280 km away. The Egyptian Government secured the support of UNESCO and launched a world wide appeal to salvage them. The world responded and the removal and reconstruction began in 1964 and continued until 1968. The temples were dismantled and relocated on the desert plateau, 200 feet above and 600 feet west of their original location. Most of the joints in the stone were filled by antiquity experts, but inside the temples, it is still possible to see where the blocks were cut. It is also possible to enter the man-made dome and see an exhibition of photographs showing the different stages of the massive relocation project. Handsome as well as heroic, Ramses matched his miltiary exploits against his conquests with the queens. He 'wed' several hundred women with whom he had one hundred sons and fifty daughters. His many offsping constituted a special class in Egypt for four hundred years and provided the country with rulers for over a century. 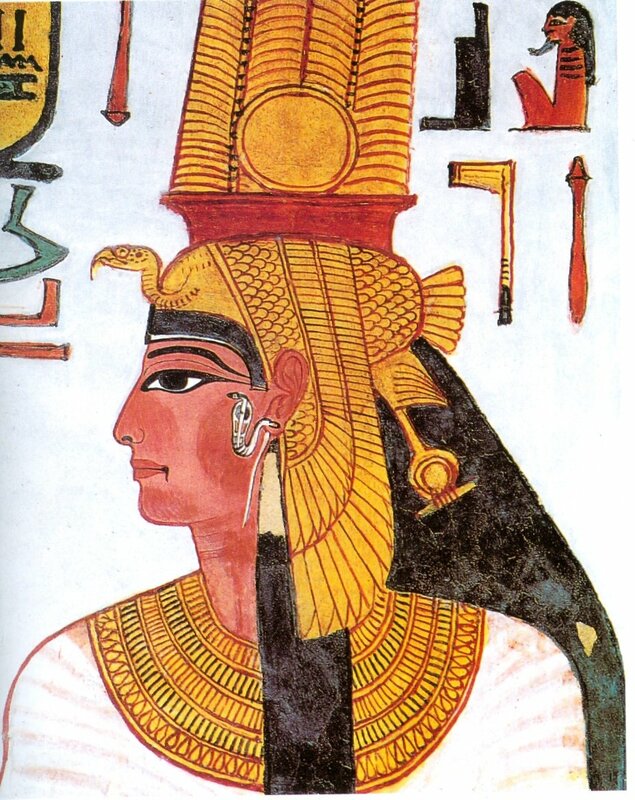 Splendid portrait of Nefertari wearing a wig in the shape of a vulture's skin topped by a feathered crown. . The tomb of Nefertari discovered in 1904 is regarded as the most beautiful tomb of all Egypt. Nefertari Meri-en-mut (a name meaning "the Lovely One, Beloved of Mut") likely married Ramses II before he ascended the throne and she held a position altogether unequalled in the history of Egypt. Numerous epithets designated her as the "sweet of love", the 'pretty-looking", the "rich in charm". Of all the other wives of this pharaoh, her primacy was confirmed by always being in Ramses's retinue, not only during civil and religious ceremonies, but even in the course of important journeys, like the one Ramses took to Nubia in the year 24 of his reign (around 1255 BCE), on the occasion of the inauguration of the little temple of Abu Simbel. She also played her own role in foreign policy too, as attested by a letter she send to Pudukhepa, queen of the Hittites, in which she declared all her sisterly friendship to the "great ruler of Hatti". 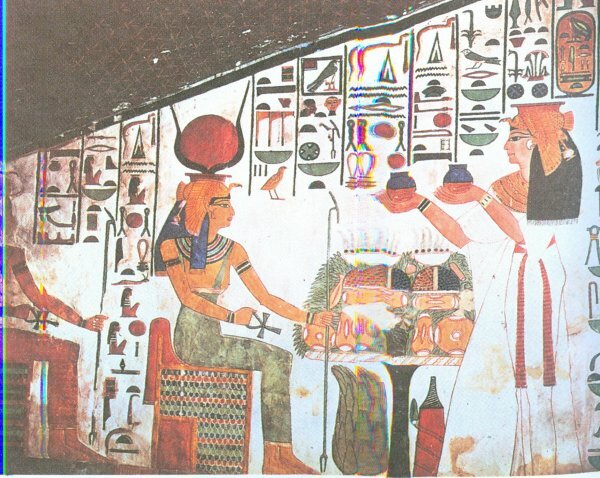 Queen Nefertari on the right is making an offering to the goddess Hathor. 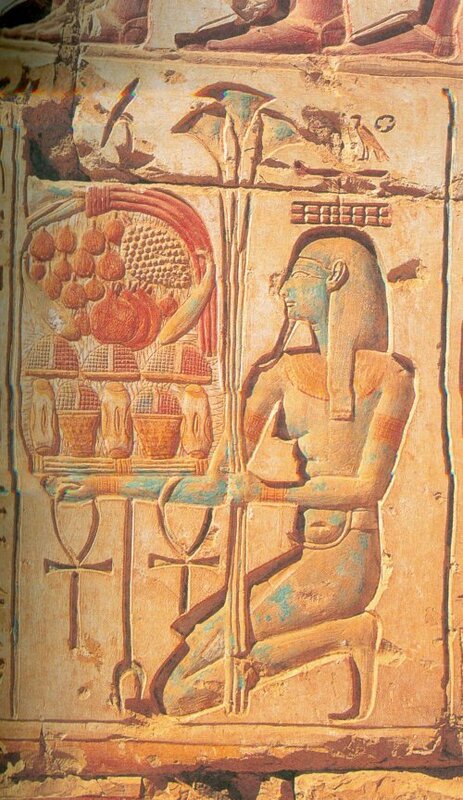 Her tomb is in the Valley of the Queens, Western Thebes. Ramses had this beautifully decorated tomb constructed for her and a smaller tomb in which she is depicted as a goddess herself receiving offerings. 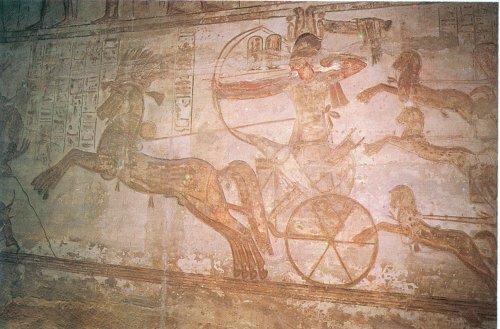 Ramses Riding with his pet lion. The funerary complexes built for the pharaohs were vast, labour-intensive projects, that provided employment for thousands and took decades to complete. 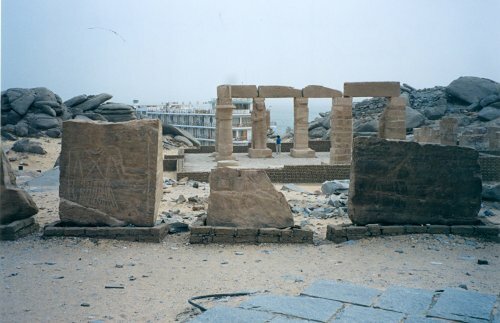 The above complex temple is located in Lower Nubia and was dedicated to Ramses' deified self and the great gods Amun-Re and Ptah. The inner temple contained eight massive statues of the king as Osiris, four on each side which also served as pillars to support the roof. At the rear of the picture is the sanctuary or the Holy of Holies into which only the High Priest or the Pharaoh could enter. Egyptian astronomers aligned the entrance to the temple in such a way, that on certain days of certain months, the sun shone directly into the temple and lit up the Holy of Holies. Temple walls were lined with carvings of captives tied together for presentation to the gods. These costly temples required a generous commitment from the people, which implied great faith in the power of the Pharaoh while he was on earth and reverence for the god in his afterlife. However, not all were filled with such faith, nor intimidated by the curses carved into stone, that were intended to instil fear into the faithless and warn them to beware. "For all people who enter this tomb and make evil against and destroy it, may the crocodile be against them on water and the snakes and scorpions be against them on land." Threats like this left many laughting, for while the temples survived the centuries, their beautiful and costly contents quickly vanished. Seemingly, no matter the dreadful consequences if the culprit were caught, the royal treasures inevitably disappeared. In many cases, the tombs were robbed of their riches shortly after the interrment of the king. 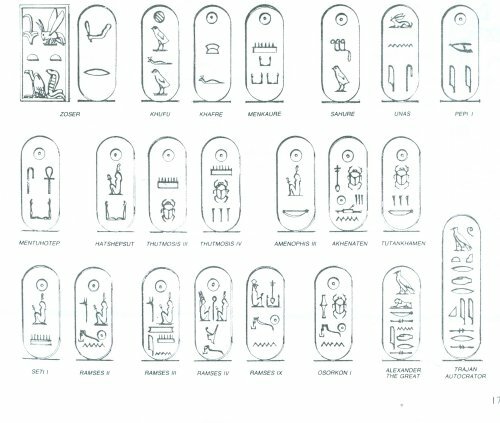 Confessions of the grave robbers recorded on official papyri, outlined how they looted the tombs and marauded and mutilated the mummies. Not infrequently the perpetrators were the very persons hired to protect the tombs. The dazzling, golden goods they guarded were simply too tempting to leave for the pharaoh to fondle in his afterlife. The great prosperity of Ramesses' reign resulted from his military and diplomatic triumphs, which produced monumental building programmes. 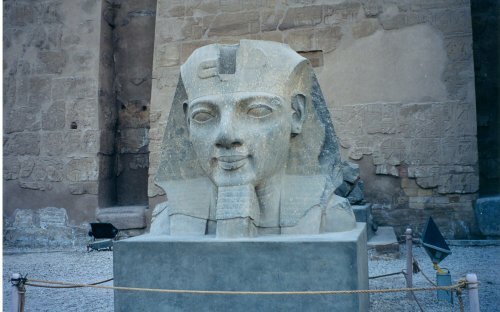 Ramses established a benchmark for all later pharaohs, many of whom adopted his name, Ramesses ('Re has fastened him') as their own personal name. With the exception of the first king in Dynasty 20 (Thebes, 1190-1075), all the other kings were known by the name Ramesses. (Ramesses III through Ramesses XI) Later works of literature harkened back to herald the memorable days of Ramesses the Great. Weaker successors to Ramses II were increasingly dominated by high priests. The Iron Age in Europe and the Aegean area resulted in better-equipped and better-trained armies. The arrival on the scene of Alexander the Great in the third century BCE and the Romans in the first century BCE. brought a rude and rapid end to the classic age of the Egyptian civilization and its achievement. Ramsses The Great's Reign (ca 1279-1213 BCE). 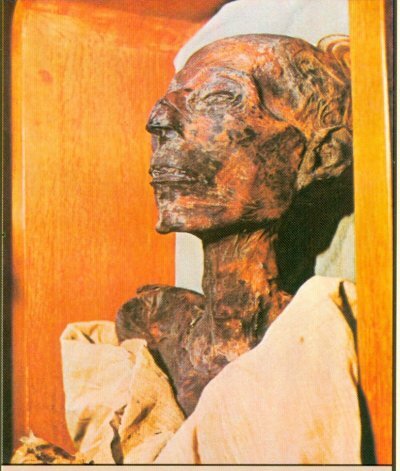 As a result of an examination in Paris in 1975, which included an x-ray, it was revealed that the pharaoh had suffered from a number of ailments associated with advancing age, not surprisingly given that he was nearly ninety when he died and had led what one might reasonably call a long and lively life. Medical conditions revealed he had hardened arteries and arthritis as well as worn molars and many abscesses.